My review of the previous episode: Blood and Bone. Faye Wakeland is driving along when another car slams into her back bumper, forcing her off the road. She's found the next day by some passing equestrians, clinging to life. Her unborn child died. Faye lived with a girl, Simone Challoner, and her brother, Noel. Noel, it turns out, was in love with Faye. He'd met her at the hospital where he worked. He doesn't know if the baby was his. When Faye dies of her wounds, he's devastated. Another possible father is Adil Dohni, a bent lawyer who had helped Faye sue her parents for her father's money. Was that legal action justified? Depends on who you ask. Faye tried to get a restraining order out on her stepmother, Susan, claiming she'd tried to run her over. Susan says that's an exaggeration - she says Faye was a habitual liar and victim. Or was Susan just a bully? Faye's married boss, Tony Everitt, knew about the baby, but his wife, Louise, seems surprised when they bring it up. Faye worked for their taxi service and Louise says the last number she gave Faye was a landline. They didn't call back when she didn't turn up. There were inconsistent accounts about Faye's character. Susan claims her stepdaughter was a "Class A blackmailer," and her bank account confirms that. She was receiving money from Roddy Macklin, a co-worker, and her boss, Tony. In addition, she'd reserved a house for one day a week, paying the college-aged tenants, Owen Reynolds and Hamed Ladd, to stay away. They were wanting for cash, so they tried not to ask why people kept coming in and out of the house. Roddy Macklin committed suicide, a move which might have been brought on by his depression or the fact that his son, Liam, was actually Noel Challoner's son. Tracking diesel fuel from the accident site leads Vera and team to discover Roddy's van, submersed in a reservoir. The back of the van is full of unpaid bills. There's a lot to keep up with in this episode. At times, it seems like none of the different threads will come together, but they do. Blethyn is always good, and I like the easy, pally relationship with Aiden. It's a relatively entertaining episode, less intense than the premiere. And fun fact: directed by David Leon, erstwhile D.S. Joe Ashworth. My review of the next episode: Home. My review of the first season of Vera. My review of the second season of Vera. My review of the third season of Vera. My reviews of the fourth season of Vera. 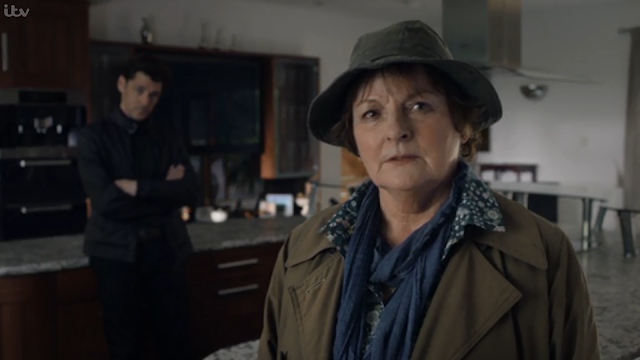 My reviews of the fifth season of Vera. My reviews of the sixth season of Vera. 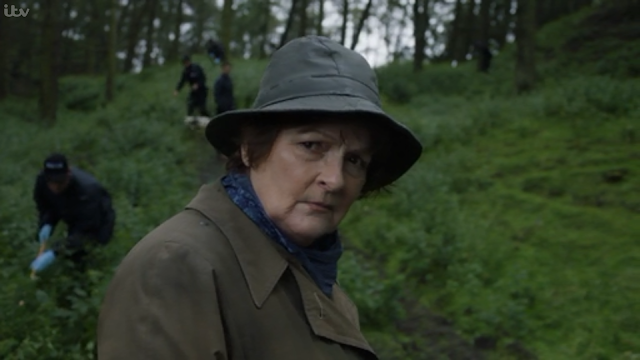 My reviews of the seventh season of Vera. If you enjoyed this article, check out my full list of detective reviews. If you want to keep up with great TV mysteries, follow my detective news site Murder! 'Orrible Murder! on Tumblr, Twitter, or Facebook. Thanks Hannah for another great review. I thought Black Ice was a marked improvement over Blood and Bone. The screenplay had just enough twists and turns, suspicious characters and red herrings to draw me in and keep me there. I knew exactly who did it for all of the final hour, only to be completely blindsided by the revelation in the last reel. The cinematography, as always, was terrific in both episodes. Somehow the producers manage to make the bleak Northumberland countryside look so beautiful. Mark and Kenny were wasted in this episode. I watched Blood and Bone twice and don’t recall Jac from that episode; if she was in it, she failed to make an impression. 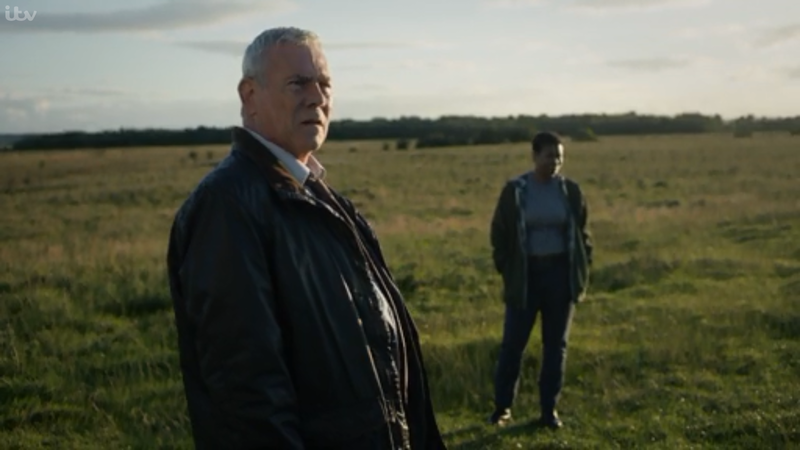 I think the writer should have allowed Aiden to find the van in the reservoir, but presumably Blethyn’s contract stipulates that Vera must be the smartest person in the room in every scene. Minor complaints. Vera is welcome in my living room on any Sunday evening. I look forward to the next instalment. Agreed on the plot - I didn't think a whole lot about why, but I found it much easier to write up this review. I cared about the suspects; it was easier to follow. I honestly didn't see the ending coming because the obvious had never occurred to me: Faye wasn't the target. I wish they'd let the supporting cast do more. Kenny is so good. I recognize the market need to have a cute supporting male, but I'd really like to see more of Kenny and Vera than Aiden and Vera. He has the authority to push her back a bit, if just because of his age. Joe had the moral authority to do it, which always added interest to that relationship. It would be nice if Aiden could start giving her a run for her money on cleverness too. Or maybe we need a Vera archnemesis! I will have to think about what sort of character they would have to be. Hi.... I am a bit confused as to who was the father of faye’s baby? If I recall correctly: Noel Challoner. I think Faye printed out the fake DNA results to ease the fact that she wanted to abort the baby. So who exactly was the father of Faye’s child? Thanks for clearing up who the father was.....now why was the student house being cleared out for Fay once a week??? Was it so new borrowers could be persuaded to borrow or so Fay could help counsel the victims? I think it had to do with Tony's business - maybe he made deals there. The accident was because Faye got slammed from behind - yet her car when discovered had no significant damage to the rear end - compounded by the fact she initially rear-ended a car in front of her after being blinded/distracted by the van’s headlights - so whatever happened to the car Faye slammed into - there was no mention whatsoever about that car, the driver that Faye slammed into or tire tracks, or debris or anyone who may have been in the car. And just what did she see when she went stomping off to the lake/ quarry unless Vera has Super-vision and could see the van thought the hill?? I thought it was just the fact that since dogs had no scent, she saw 'a potential hiding place' for the van and asked for 'divers' rather than dogs. Backing up to the crash. Straight road, why not speed up? I WOULD like them to include some dialog .. as advice to viewers/ those in that situation.. such as "If being rammed from back, why didn't driver just accelerate?" Isn't that what we were all thinking as she got hit the 2nd or 3rd time? Why did Faye tell Noah about the baby if she was planning on terminating the pregnancy? Vera later stated Faye faked the DNA test to make Noah " feel better" since he was sad that he never had a father/son relationship with Liam Wouldn't it make more sense to keep the pregnancy a secret and no one would know any better? WARNING: Blogger sometimes eats comments - copy before you post. Real names tell you the story of things they belong to in my language...It is a lovely language, but it takes a very long time saying anything in it, because we do not say anything in it, unless it is worth taking a long time to say, and to listen to.